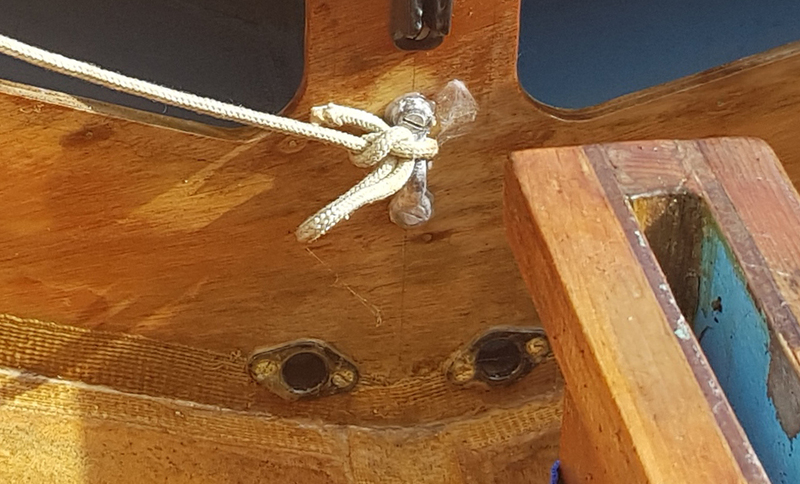 A metal eye is screwed in a vertical position 2/3rds down the centreline of the stowage bulkhead so the screws penetrate into the mast step web. 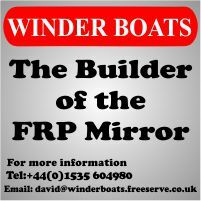 This basic system helped keep costs down (remember early Mirrors were built down to a price). No more knots to untie the kicker! The pulley attaches to the bulkhead lacing eye, the cord is taken over the boom and back down through the jambing device to hand. So, 2:1 purchase, but, with no block attached to the boom, a lot of friction. It wasn't long before racing sailors were adding a second block to reduce friction and produce a more workable system. Systems which use a block with jambing device attached to the bulkhead are, in my experience, quite difficult to adjust. 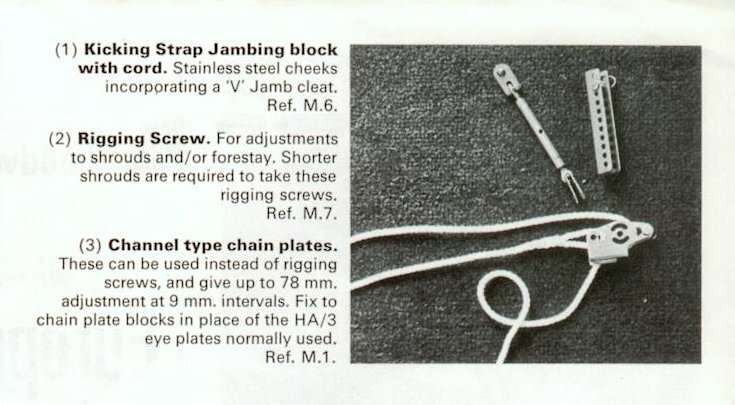 Since only the amount of purchase was limited by the Mirror class rules, other fittings and blocks were allowed, so a varitey of kicking strap systems developed (e.g. some sailors used a cam cleat mounted on the aft edge of the daggerboard case (wooden boat) or under the thwart to cleat the kicking strap control line. If you go for under the thwart, you need to mount the cleat on an angled block so the cleat base is parallel to the line taken by kicker control line coming from the stowage bulkhead, otherwise the line will just pull out of the cleat when tension is applied. Over the years kicking straps have become easier to adjust and, when the class rules changed to allow it, more powerful. At some point (mid to late 90s I think), the class rules changed allowing up to 4:1 purchase. Current class rules allow up 8:1 purchase on a conventional kicking strap or a strut system (normally called a GNAV which is vang, the American name for a kicking strap, spelt backwards) mounted above the boom. The kicking strap is often one of the controls led back onto the aft edge of the thwart. The original practice of having the kicking strap attached to the boom by a loop around it carries on. It's simple and mechanically very strong. The strain on a fitting on top of the boom to locate the attachment is minimal. 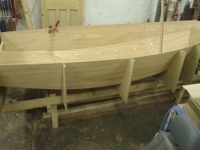 On the other hand if you put a fitting, such as a deck clip, on the bottom surface of the boom and attach the kicking strap to that, the fastenings will be under considerable tension. Mechancally this is quite weak. 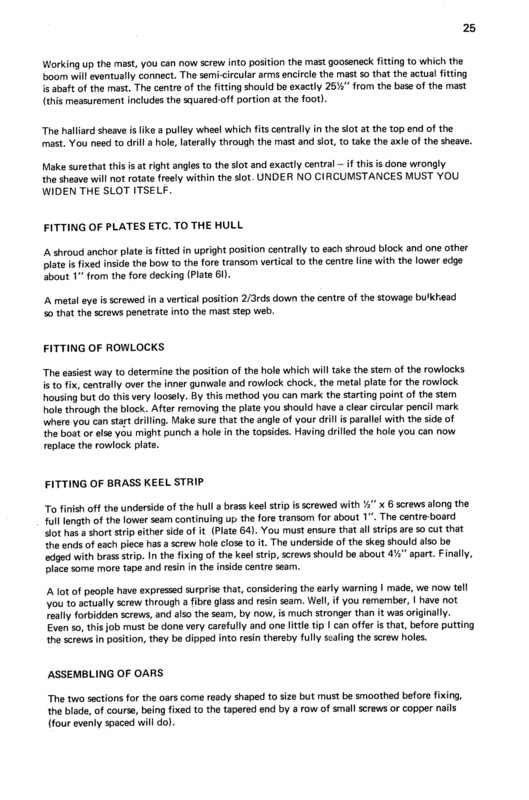 The location of the kicking strap attachment point on the boom used to be controlled in the class rules. When centre mainsheet systems were introduced this rule was removed to enable the kicking strap to be located further forward and give more room for the crew. The location of the kicking strap is "self policing" since moving the attachment point forward reduces the length of the lever formed by the boom pivoting at the gooseneck and this makes the kicking strap less effective. The rule used to be for the kicking strap to be attached a minimum of 483mm from the inner end of the boom. On my own boats I currently have the kicking strap attached 433mm from the inner end of the boom. The other end of the kicking strap can be attached to the stowage bulkhead or to the bottom of the mast. Since the Bermudan rig was introduced there has been a trend in the UK to attach the kicking strap to the bottom of the mast, or to the deck, just behind the mast step. This location means more room for the crew and more thrust is directed along the line of the boom, helping to bend the mast. However, there is less force downwards, reducing the effective mechanical advanage. Attaching the kicking strap to the deck (as on the Winder) has the advantage when you come to transport the boat, the kicking strap and boom can stay rigged, and the boom travels inside the boat and there is no part which has to be unshackled from the mast. If you are going to use the forward mast position, you can't produce a workable system with the kicking strap attached to the bulkhead, it needs to go on the mast or just aft of the (forward) mast step (so it's more or less on the axis of the horizontal movement of the boom at the gooseneck). Here are some links to detailed descriptions of various kicking strap systems. More kicking strap & GNAV systems coming dreckly.